Now that I’ve gotten engaged in a regular practice of ancestor veneration, I’ve turned my attention to learning more about my ancestral gods. One particular pair that’s caught my attention as being particularly apropos to my life are Bragi and Iðunn. Bragi and Iðunn (pronounced EE-thuhn, sometimes Anglicized to Iduna) are two gods of the Æsir (EYE-zr), the main pantheon of the Norse. Unlike a lot of their more rough-and-tumble brethren, this husband and wife pair are the skald of the gods, and the goddess who cares for the apples of immortality – a poet and a healer. 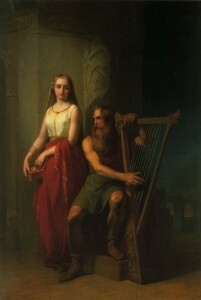 The Poetic Edda tells us that Iðunn is the daughter of the dwarf Ivaldi, which makes her the sister of the blacksmiths who made three (possibly four) items of great power: 1) Freyr’s ship which always has a fair wind and could fold up to fit in his pocket; 2) Odin’s spear (Gungnir) which he will carry into Ragnorak; 3) Sif’s hair, which had to be replaced after Loki stole the original; and possibly 4) Brisingamen, Freyja’s necklace (which our mascot Bri is named for!). Her mother is sometimes believed to have been a valkyrie (although I’m not sure that’s verified in the Lore) – which would explain why she lives in Asgard instead of with the dwarfs. I haven’t seen a legend that tells how she and Bragi met or how she came to be in charge of the apples. Iðunn comes across very gently in the Lore. She’s easy-going and is one of the few gods who doesn’t let Loki and his foul mouth get under her skin in the Lokasenna, a tale in which Loki crashes a party and horribly insults everyone present. Her most famous story comes from the Prose Edda. The Æsir have always been great enemies of the jötnar – the frost giants (think Laufey from the movie Thor, for those who’ve seen it), and many tales revolve around the gods’ exploits in Jötunnheim (the land of the jötnar). 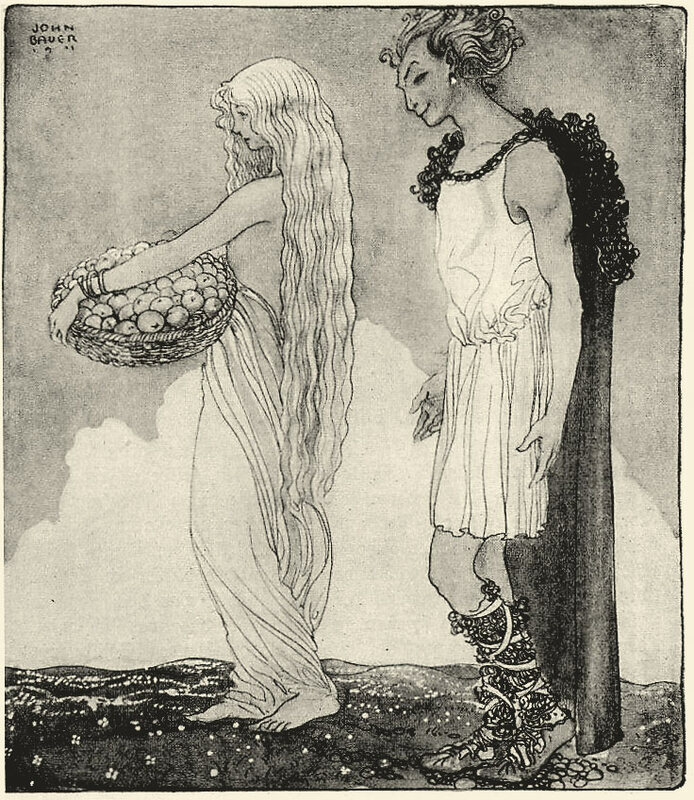 One day the jötunn Thjazi blackmailed Loki, the trickster of Asgard, into helping him kidnap Iðunn and her apples of eternal youth. Loki told Iðunn he’d found an apple tree outside the gates of Asgard he thought she would like and suggested she bring her own apples out to compare. He led Iðunn into a forest where Thjazi waited in the form of an eagle. Thjazi swooped down on Iðunn and carried her away. In Asgard, the gods began to age. The Æsir called a Thing – a formal meeting to settle legal issues democratically – and quickly figured out Loki was the last one to be seen with Iðunn (not a big surprise, I’m sure; Loki was always causing trouble). They demanded he rectify his mistake and rescue her. Loki borrowed Freyja’s falcon cloak and flew to Jötunnheim. He waited until Thjazi was boating and sneaked into his home. Using his magic, Loki turned Iðunn into a nut so he could carry her back to Asgard in his falcon claws. Thjazi saw them fly away, and transformed into an eagle to pursue them. Loki just beat him back to Asgard where the Æsir were waiting with weapons of fire to face the ice giant. A battle ensued, and the Æsir won. Iðunn was safe, and the Æsir regained their health and youth with the return Iðunn’s magic. Iðunn, to me, has the qualities of a good hedgewitch. She tends her garden and provides food that heals the gods. She reminds us of the healing power of the foods we choose eat – and the destructive power of malnourishment. I’m not much of a gardener (though I make another attempt every year), but I am a foodie, and I do most of the cooking in my family. I have started calling on Iðunn when I’m cooking to bless my skill and help me make wise choices in what I feed my loved ones. Also, she helps me remember the importance of culinary craft and to not undervalue my work in the kitchen. Without the work of her hands, even the gods would die. Bragi’s history is less known. One poem calls him as a son of Odin (one of many) but there are no direct references in the Lore as to who his mother might be. However, like a lot of other Heathens, I think it makes sense to assume the poet of the gods is the son of Gunnlod, based on a story told in the The Prose Edda and The Hávamál. According to the Lore, poetry (or poetic inspiration) was created violently from a series of killings and betrayal which would take too much space to get into here. Suffice it to say, poetic inspiration ended up as a vat of mead. Anyone who drank the mead became a sage and a poet (and potentially went crazy in the process). The jötunn Suttung gained possession of the mead. He locked it in a cavern along with his daughter, making her its guardian. Odin, the great wisdom seeker, wanted to bring it to Asgard. He figured out where it was (again through a far more complicated story than I’m going to relate here) and bored a hole in the cavern to reach the mead. Gunnlod offered to give him a sip of the mead for every night he stayed and made love to her. For three nights he shared her bed. Each morning he took big enough “sips” that by the third night he had drunk the whole thing. Gunnlod helped him escape, and Odin brought the mead back to Asgard where he spit it back out so poetry could be shared with the other Æsir and select humans. 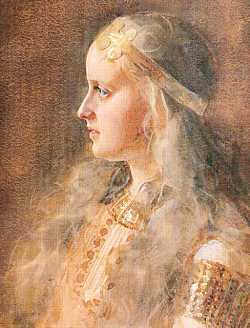 Many of us believe Gunnlod must be Bragi’s mother – the poet was conceived when hidden inspiration (Gunnlod) joined with a seeker of wisdom (Odin) on a daring adventure to share this power with the world. Bragi isn’t just the poet who sits in his room composing lyrics he will never share, he’s a skald (or bard for you Celts and D&D fans 😉 ) who composes with the purpose of delighting a crowd. Bragi is as much about the communication of his story and the spread of fame – both his and of the people and legends he writes about – as he is about the composition. As one of my friends said this Yule, Bragi is the god of the published author, not the random scribbler, of the band playing a gig not the band playing a garage. * We call on him when we want help becoming a writer (or musician or other artist) worthy of fame and we call on him when we want help making good decisions that will make luck more likely to flow our way. I’ve found two beautiful sites, one for Bragi and one for Iðunn. This group’s work isn’t entirely Lore-based (as they warn you on the front page) but I found their information and devotionals to be really helpful, and thought you might enjoy them as well if you’re interested in exploring more about the healer and the poet. * Of course most artists are scribblers and garage band members before they are paid authors and musicians, but there is a difference between someone doing an art form as hobby and someone doing art as a dedicated craft intended for public consumption. Not that there’s anything wrong with dabbling, but it is a different mindset, and the way I perceive Bragi is that he’s about the working artist (or at least the artist seriously trying to get work). Thanks for this great post, Jax (Hi! I’m new to this site). I’ve been eclectic for awhile but I’m researching different deities and traditions that speak to me. I’ve looked into our family history and found that in our more recent past, (relatively speaking) our ancestors were in Ireland and Scotland and that area for a long time which is neat because I love celtic mythology. But even more research (plus my mom doing National Geographic’s Genographic Project) has shown that farther back our ancestors were in Scandinavia. I’ve been learning about Norse mythology, but it’s wonderful to hear about these deities from a personal perspective. Welcome to the site, Arianna! The Celts and the Norse have a lot in common, and it’s fun to see where their stories overlap. In my research I actually saw some speculation that Iðunn might be a shared goddess or that her stories were influenced by Celtic myth due to recurring elements in them that are very Celtic in nature. I’m not scholar enough to comment on that, but I thought it was interesting. I like your website. The background leaves are beautiful and you seem like a really cool person. I sometimes think being a Pagan in Texas can be challenging (although I live in Austin where it’s not so big an issue as it would be in, say, Dallas or (worse) small town Texas), but I imagine it’s very challenging somewhere like Utah where the culture is so overwhelmingly one one faith. Blessings to you (and to the other Pagans or other people of minority faiths) living in such places! Nifty, do you have any recommendations for sites or books I could plunge into for more info? Googling is great, but I like to hear what people recommend. And thanks, it’s nice to hear that. I’m so happy that even though I’m in a place like this I can still reach out to other Pagans with the help of technology. I’ve also been doing some research and found some groups and stores here, so I might not be as lonely as I thought I’d be. If you’re referring to books on a Celtic/Germanic tie, I’m not sure where to point – most of what I’ve seen I’ve gathered online. If you’re talking about books and other resources for Heathenry… well, I started writing that and it got post length real quick. So, er, thanks! You inspired next week’s post! Barring some bizarro event, Tuesday I’ll have an organized list of recommendations for Heathen/Norse reading with basic info on what you’ll get from them and why I rec’d them. We love getting post ideas from all of you awesome readers, so if you (or anybody else out there) has questions or something you’d like us to post about, please feel free to let us know! Swell, I look forward to reading that post. Hi! I haven’t been able to find a contact page on your site so I’m posting a quick word about this here instead: I’m the editor of Pagan Living magazine, a quarterly publication about home, garden, food, etc. I was wondering if you might be interested in contributing an article to the summer issue – you can check out the brand new spring edition at our website. Thanks! Very nice essay Jax! 😉 Iðunn & Bragi are special to me. Thank you for featuring them. Anyway, welcome to The Realm! I enjoyed reading your Pagan story on my bio page. Thanks for sharing! my compliments to your article about Bragi and Idunna as they are ofter overlooked God and Goddess in Asatru.